Santa Barbara lies on the Pacific Coast to the northwest of Los Angeles and with lovely Spanish architecture and Mediterranean climate, it’s no wonder that it’s known as the "American Riviera". It seems fitting that one of the greatest and most stylish courses in the USA nestles unassumingly in this cosmopolitan locality. Dr Alister MacKenzie designed the Valley Club of Montecito in 1929 and by MacKenzie’s standards it is one of his more modest designs. There’s nothing bold or brash about the Valley Club it’s just a subtle and sophisticated layout. Robert Hunter implemented the construction and perhaps that is one reason as to why the course sits so naturally on the Montecito property. The Valley Club of Montecito is one of the least pretentious courses in the USA and for that reason alone it deserves its rightful place in the Top 100. With a salty sea breeze blowing and the sun shining we doubt there is a more charming and peaceful place to play golf in the world. Normally I’d say the opportunity to play a course designed by Alister MacKenzie is a real treat so the fact that Valley Club was my 3rd MacKenzie gem on this single trip can only be described as a dream come true. Valley Club was one of the first courses to adopt a new grass type that could survive with far less water due to the drought being suffered in California. Before hearing this I had already commented about what a wonderful impact the drought has had on what I can only imagine would of otherwise been very lush and green conditions at many of these very private California golf clubs. Nothing of the sort was experienced at Valley Club and oh how wonderful this relatively unknown MacKenzie treasure is. Valley Club is a poster child for what kind of creativity and wonderful use of the available land can be achieved by the best architects. Add near perfect maintenance and 85 degrees and you have all the makings for an awesome day on the links. The first thing you notice at Valley Club is the beautiful yellow brown color of the course, perfect firm and fast and full of short grass. The greens are very undulated and highly reward a solid strategy off the tee to set up your approach shot based on the days pin positions. MacKenzie does a wonderful job of utilizing all the distinct features on the course. Examples would include the usage of various little hills to rest greens or tees, dry washes to add hazards as well as a wonderful usage of the courses boundary lines to challenge the ideal lines of play. There most certainly are not many better days of golf in California by this what I can only call a highly underrated MacKenzie gem. Why is The Valley Club such a highly rated course and agreeable place to tee it up? In two words: Alister MacKenzie. The Valley Club was designed in 1929 by Alister MacKenzie and Robert Hunter. 1929 was at the height of MacKenzie's output, having completed Augusta National the same year and Cypress Point the year prior. One of the defining characteristics of The Valley Club are the signature MacKenzie greens. In addition to the subtle breaks and the mountain/ocean effect, the greens are also small. Like at another MacKenzie course, Crystal Downs, I found putting here difficult. The other key feature of The Valley Club are the MacKenzie-designed bunkers, which he works into the course with his 'camouflage' effect very skillfully. Many are optical illusions. Often, what looks to be a greenside bunker is actually set back from the green. At 225 members, The Valley Club doesn't get a lot of play and is difficult to wangle an invitation to. The Valley Club is a gem with immaculate greens and truly beautifully designed holes. Even in all that slop and muck, I shot 88. I would love to play this gem on a beautiful day. Larry Berle. “The Valley Club” was designed in 1929 by Robert Hunter and Alister MacKenzie, who was then at the height of his career, having recently completed Cypress Point in 1928. 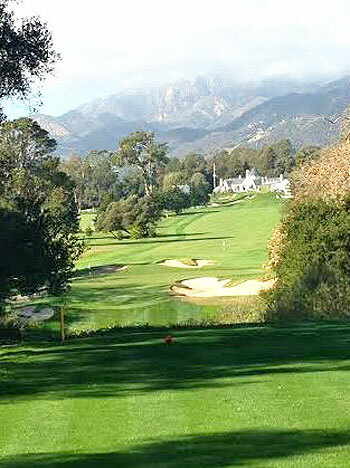 Some of the defining characteristics of The Valley Club of Montecito are the high quality small greens, subtle breaks due to the mountain/ocean effect, peaceful settings with mountain backdrops, as well as MacKenzie-designed bunkers which works into the course with a ‘camouflage’ effect. The strength of the course is the sensible location of hazards and the ability of the designers to route interesting holes across the diverse landscape. Green and bunker shapes here are slightly less exaggerated than on a course like Pasatiempo, yet the design is similarly centered on sophisticated golf holes that all players can handle, but the scratch golfer can only master with calculated play. The artistic bunkering is outstanding while the greens, which are generally smaller than others by MacKenzie, blend naturally into their surrounds and are full of contours and sharp angles. As with many courses from the Golden Age, The Valley Club had lost some of its character and style over the decades, but gratifyingly a recent program by Tom Doak has restored the integrity and quality of the initial design. Aside from returning MacKenzie’s greens and irregular bunker shapes back to their original proportions, Doak and his team also reduced areas of rough grass and reinstated closely mown fringes around the putting surfaces. The club continues to add tee boxes, adding length to many of the par fours and offering new (higher) vantage points to view each hole. Being a member of the MacKenzie society, The Valley Club took a leaf out of Royal Melbourne’s book and incorporated a unique blend of three types of bent grass into its greens and rye grass fairways, offering world class playing conditions. Thanks to the successful restoration, the Valley Club now owns one of the best-preserved and most authentic MacKenzie designs to be found anywhere in America. Having visited numerous MacKenzie designed courses on this trip; The Valley Club is often referred to as one of the best conditioned courses that often has only a half-dozen groups on the course at one time. With roughly only 300 members, The Valley Club is very exclusive and subsequently does not get a lot of play. As I packed my bags and headed to the airport, I smiled at the portrait of the good Doctor hanging masterfully over the fireplace. Days like this will stay with me forever.